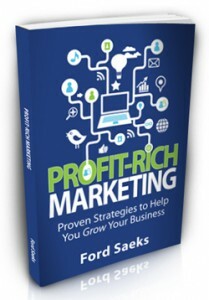 The time-tested and proven tips and strategies in Ford Saeks’ Profit-Rich Marketing: Proven Strategies to Help You Grow Your Business are designed to give you a big boost in growing your business. Some of the concepts may be familiar, but it’s not what you know—it’s what you do. That’s why you’ll find great value in the quick-read ideas presented, designed for easy implementation.